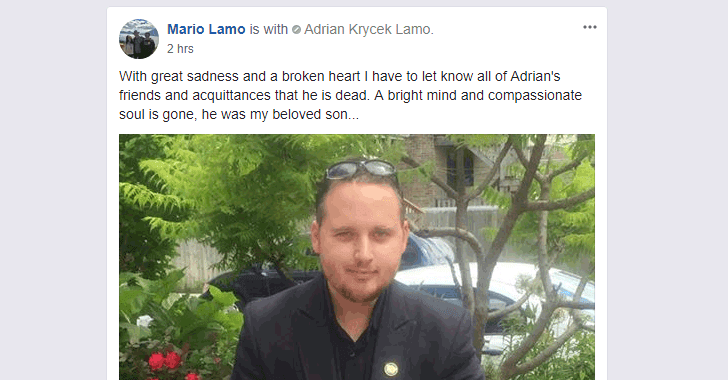 Adrian Lamo, the hacker who tipped off the FBI about Wikileaks whistleblower Chelsea Manning, dies at the age of 37, according to a Facebook post by his father Mario Lamo-Jiménez. "With great sadness and a broken heart I have to let know all of Adrian's friends and acquaintances that he is dead. A bright mind and compassionate soul is gone, he was my beloved son..." he posted. At this moment the cause of death is unknown, though reportedly Adrian was diagnosed with Asperger Syndrome in July 2010 and briefly hospitalized. Adrian was a former hacker, threat analyst, and writer, who had previously been behind several high-profile security breaches but gained headlines after breaking into The New York Times computer systems in 2002. Adrian was given the appellation "Homeless Hacker" by the media because once when he was unemployed he wandered the country by Greyhound bus and hacked corporations from inside abandoned buildings. He spent almost six months on home detention and studied journalism before becoming a threat analyst. When former US Army intelligence analyst Chelsea Manning (then Bradley Manning) read about his hacking profile in Wired magazine, Manning contacted him, and the pair started exchanging messages online. Manning found Adrian a "kindred spirit" and told him about his role as an informer for WikiLeaks and how he leaked the most controversial combat video footage of a helicopter shooting unarmed Iraqi civilians and 260,000 classified diplomatic cables to the whistleblowing website. "There were no right choices that day, only less wrong ones. It was cold, it was needful, and it was no one's to make except mine. I couldn't just do anything, knowing lives were in danger, it's classified information, and when you play Russian roulette, how do you know there's not a bullet in the next chamber?" "Choosing to interdict a man's freedom knowing it could mean his life, is something that's easy to judge but can only really be understood by living it." Manning was arrested in May 2010 and sentenced to 35 years in prison for leaking classified documents, though her sentence was later reduced by President Barack Obama, and she was set free last year.